After moving to Michigan from Portland, Oregon the husband and wife team behind Damn Handsome had a thirst for craft beer was – well – unquenchable. Fortunately they had one of the largest craft beer cities right in their back yard. And after getting to know many of the brewers in the craft beer community – and the more Jarrett and Bridget learned about the craft brewing process – the more they realized so many healthy ingredients went to waste. At the same time they also recognized that when it came to grooming products, guys got the bottom of the barrel as far as natural choices. Enter light bulb. At Damn Handsome we parter with crafter breweries to re-purposed their used goods into healthy grooming products for guys. We value what’s useful, what is classic, well-made, hardworking and long-lasting. This is why our goal when we started Damn Handsome was – and always will be – to sustain a brand that is useful without introducing unnecessary waste into the carbon cycle. Our motto is damn simple: Work Hard. Do Good. Stay Handsome. It’s our commitment to the lives and livelihoods behind each product we produce. And that’s why for every Damn Handsome purchase we donate soap to those in need. How did you find out About CustomKraftBox.com? 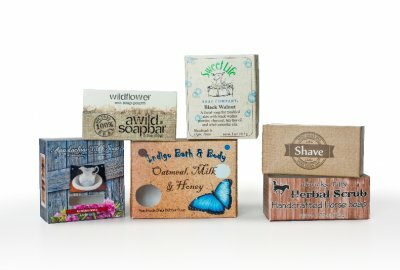 Through poking around online for recycled custom kraft boxes with low minimums and then as we were getting closer to taking our boxed products to market we reached out to some friends in the industry and CKB kept coming up with glowing reviews. CKB gives our brand so many options to show case our goods while still staying dialed into our brand story. The selection is huge so we’re able to always find a shape and size that looks totally custom without any upfront cost like with typical packaging companies. To learn more about Custom Kraft Box, visit our website. Feature Friday: Loyal Canine Co.
Let’s Get Krafty with Natural Backgrounds!